Add these trendy plant containers to your home today for an elegant interior style. Each of these glass plant pots were hand blown and made with care. Clear glass with an opening, you can water it, fill it with plants or decorative accents. Go for a zen atmosphere, vintage, or contemporary look. 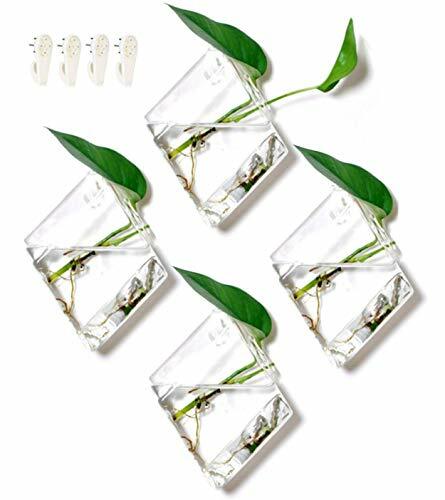 These wall plant holders have a small hole in the back and with the hook included, you can hang the plant terrarium to any wall, with easy mounting and removal. Glass plant pots come in a unique diamond shape with a flat side, allowing you to place these on any tabletop or flat surface. We fully back every purchase with 100% money back guaranteed. If you're not satisfied, return your order within 30 days. No questions asked. SET OF 4 TERRARIUMS - This value PACK OF 4 clear diamond-shaped hanging glass terrariums (Length 5", Width 2", Height 7") will make a great addition to your home to give any space a unique decorative accent. Set also includes 4 hooks to easily hang the glass vase to a wall. Perfect as accessories for the modern house. ADDED FEATURES - Includes 1 side hole on each hanging terrarium for easy watering. Each hanging vase has a small hole in the back and hook included, so you can hang the glass terrarium to any wall, with easy mounting and removal. Glass planters come in a unique shape with a flat bottom to give you the option of laying them on a flat surface as tabletop décor. New and improved packaging, secured in sturdy styrofoam, ensures safe shipping of these beautiful glass planters! ELEGANT HOME DÉCOR - Use these stylish geometric terrarium containers as an air plant or succulent holder. This Set of Four (4) wall terrariums allows you to mix and match with décor ideas, such as wall decor, indoor, or outdoor gardening décor. No plants or decorative items included in this set. Add these airy and light DIY hanging planters to any area in your home for some nice greenery. GREAT FOR SPECIAL OCCASIONS - GeoTerrariums plant holders bring elegance to wedding tabletop décor centerpieces & favors, parties, birthdays, and make perfect gifts for gardeners, loved ones, or housewarmings. Use the terrarium to replace a vase, pot container, or lantern, and as a holder to hang real, live or faux artificial plants. Mount on a window, desk, table, shelf, desktop, anywhere really! HAPPY CUSTOMER GUARANTEE - Our glass plant pots are backed by our 30-day money back guarantee. We are confident that you'll love your new faceted terrarium so if you're not 100% satisfied return for any reason. If you have any questions about this product by GeoTerrariums, contact us by completing and submitting the form below. If you are looking for a specif part number, please include it with your message.